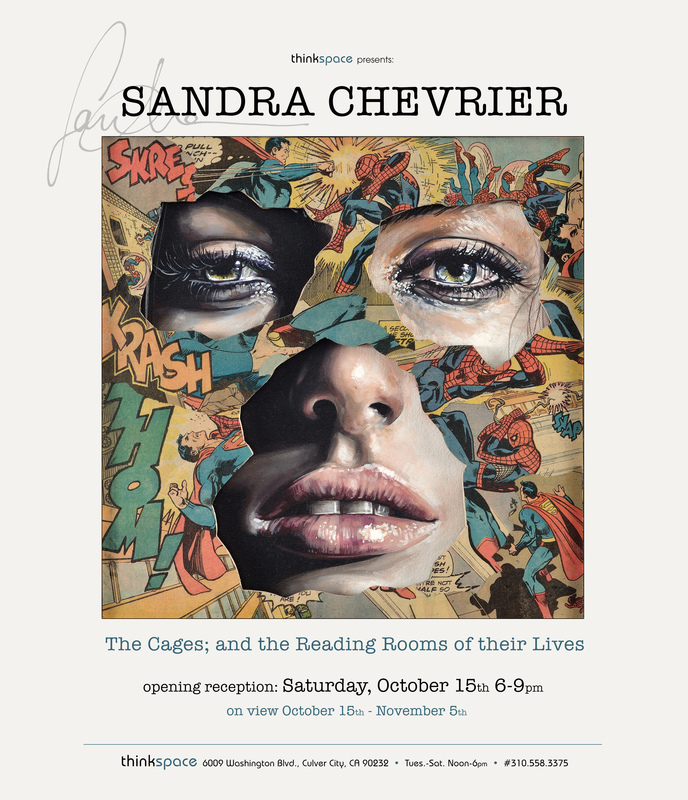 (Los Angeles, CA) – Thinkspace is pleased to present new works by Sandra Chevrier in the gallery’s first solo exhibition for the Canadian artist, The Cages; and the Reading Rooms of their Lives. 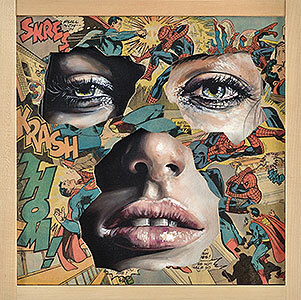 Based in Montréal, Chevrier creates mixed media works that combine sensuously rendered portraits of women with painted and collaged comic book overlays of superheroes. Manifold graphic segments and tear aways are used to obscure the facial features and bodies of her subjects partially. These iconographic images of conflict and struggle are posted over the contours of the flesh to create endlessly nuanced combinations, both heroic and dystopian in their allusions. Chevrier creates beautifully strange alloys of body and print to convey a personal terrain beset by social conflict. In the artist’s Cages series, the vulnerable and human is offset by images of the superhero in varying situations of compromise, fragility, and struggle. The collision of identities both imperfect and paladin, suggests a conflicted and difficult vision of femininity; one colonized by competing ideals and expectations. Plastered both literally and figuratively with an illustrative veneer of superhuman archetypes and ideals, at times themselves in a state of injury or defect, Chevrier’s women become embattled vessels containing a host of incongruous roles. Her paintings are visually moody and dark, in spite of the primary colors and illustrative pictorials, and convey a depth and discomfort that resonates. Chevrier creates what she refers to as “masks” and “cages” from these comic book excerpts, exploring both the external dictates and self-imposed restrictions to which the feminine is subject. Her confine metaphor of scripted identity problematizes the reductive social roles ascribed to women. Chevrier works with a combination of acrylic, watercolor, graphite, china ink, pastels, and collage to create complex sequences of imagery. Each portrait is developed intuitively and offers a simultaneity of scripts: heroism and weakness, beauty and imperfection, order and chaos, revelation and withholding. Chevrier is interested in the flaws in these narratives and seeks comic book references that capture moments of vulnerability and contention: failures in the hero and chinks in his otherwise unassailable armor. A constant dance takes place in these works. Fiction bleeds in and out of reality, and several competing narratives obscure the identity of the subject. Ultimately, the imaginary and the real are equally unreliable in their deceptions and Chevrier’s portraits capture the multidimensional mire of this human fraudulence. The constant pressure to perform clearly defined roles is at odds with our true nature: we are all heroes and villains, successes and failures. Each face, each body and each self is a patchwork of conflicting stories.